Institutions, the rules of the game that shape repeated human interactions, clearly play a critical role in helping groups avoid the inefficient use of shared resources such as fisheries, freshwater, and the assimilative capacity of the environment. Institutions, however, are intimately intertwined with the human, social, and biophysical context within which they operate. Scholars typically are careful to take this context into account when studying institutions and Ostrom’s Institutional Design Principles are a case in point. Scholars have tested whether Ostrom’s Design Principles, which specify broad relationships between institutional arrangements and context, actually support successful governance of shared resources. This article further contributes to this line of research by leveraging the notion of institutional design to outline a research trajectory focused on coupled infrastructure systems in which institutions are seen as one class of infrastructure among many that dynamically interact to produce outcomes over time. Many challenging problems facing modern societies involve social dilemmas related to natural resource and environmental governance. As readers of this journal are well aware, there is a considerable body of scholarship focused on understanding what factors enable groups to solve social dilemmas and effectively govern shared resources. Solutions to social dilemmas involve addressing two related problems: (1) individuals in a group face choices in which the best outcome can only be achieved if the group coordinates their decisions to maximize the total group payoff and (2) there is no way to guarantee others will coordinate decisions for the benefit the group, so individuals face strong incentives to make a choice that is best for themselves but may have negative impacts on the group (Ostrom et al. 1994). Following Hardin’s (1968) seminal article on social dilemmas, the dominant theoretical discourse for the subsequent 20 years suggested that resolving social dilemmas requires the intervention of an exogenous governance body that either solves problem 2 by directly restricting choices of actors or solves problem 1 by establishing and enforcing property rights. While effective in particular situations, top-down regulation or property-rights-based policy interventions have frequently demonstrated that the devil is in the practical implementation details. Critiques of these policy responses often describe specific circumstances related to local context that either enabled or prevented their success (Von Weizsaecker et al. 2005; Acheson 2006; Clark 2006). This experience suggests that focusing attention on governance without considering the system in which it is embedded, in its entirety, will be misleading. As a result, principles of good governance derived from relatively context-free, general theory will be of little use in practice. Ostrom referred to this mismatch between a few general policy prescriptions and the huge diversity of local contexts as the problem of panacea thinking and called for academics and practitioners alike to move beyond it (Ostrom et al. 2007; Ostrom 2010). Ostrom’s call, however, presents us with a dilemma. A significant body of empirical research provides us with many case studies in which communities have successfully solved social dilemmas in a wide variety of common pool resource (CPR) contexts using a wide variety of institutional arrangements. Although these studies provide important insights about interdependencies between governance arrangements and context, they also challenge us to make sense of the variation in the data. On the one hand, we claim that simple panacea solutions based on general, context free theories are bound to fail. On the other, can it be that each social-ecological context requires its own fine-tuned set of institutional arrangements? Can such fine tuning only be achieved through relatively long-term, dynamic co-evolutionary processes of the kind associated with examples of long-lived CPR systems? Can we identify robust empirical patterns across highly variable, detailed case studies that are useful for the analysis of modern policy problems? A key challenge scholars face in addressing these questions is to identify meaningful, generalizable structure within the entire range of endogenously generated and enforced institutional arrangements capable of governing shared resources. Our goal with this paper is to explore how we might leverage ideas from institutional analysis and systems science to contribute to our capacity to meet this challenge. Specifically we build on a long tradition of research at the intersection of social and natural sciences that began with the development of the IAD Framework more than three decades ago (Kiser and Ostrom 1982) followed by the development of the notion of “social-ecological systems” (SESs) (Berkes and Folke 1998) through collaborations between ecologists and a range of social scientists in the resilience community. Based on this early work, Anderies et al. (2004) subsequently developed a framework to aid in studying how the links between institutions, governance, and ecological systems impact the capacity SESs to cope with uncertainty and change. These ideas were then further developed in three iterations by Ostrom (2007), Poteete et al. (2010), and Ostrom (2009) into the so-called “SES Framework” designed to facilitate interdisciplinary research. It is important to emphasize that we are not proposing yet another framework. Our goal is to re-conceptualize and refine ideas around the existing IAD (Kiser and Ostrom 1982), Robustness of SES (Anderies et al. 2004) and SES (Ostrom 2009) Frameworks to increase our capacity to study the interdependencies between social, natural, technological, economic, and institutional processes that codetermine outcomes in SESs. We have opened by suggesting that attempts to identify robust patterns related to good governance or effective institutional arrangements across different contexts is difficult because their function is so intimately connected to the social-ecological context in which they operate. We may, however, be able to identify patterns regarding how combinations of various system components, e.g. belief systems, built and natural environments, institutional arrangements, and value systems generate different outcomes. To do this, we must identify an appropriate unit of analysis and develop an associated set of methods. We suggest that an appropriate unit of analysis is the “Coupled Infrastructure System” (CIS). A key point to emphasize is that a powerful theoretical framework exists in the Institutional Analysis and Development (IAD) framework and its various extensions. As Poteete et al. (2010) suggest, we as a research community must continue to work together to develop conceptualizations, models, theories, tools, and methods to actualize these existing theoretical frameworks to build systematic, empirically-based theories of social dilemmas related to the environment. Since the publication of Anderies et al. (2004), we have worked to integrate concepts from institutional analysis with concepts such as resilience, robustness, and non-linear dynamics from ecology, economics, systems science, and engineering. In Anderies et al. (2004), we used the term public infrastructure to describe the physical infrastructure and public services required to manage the use and maintain the functioning of shared resources. The analytical unit of Coupled Infrastructure Systems extends the notion of infrastructure to various other system components which allows scholars to then focus on the feedback effects generated by linked infrastructures. In other words, dynamics are brought to the forefront. In the remainder of this section, we discuss methodological challenges through reflections on our efforts to empirically test Ostrom’s Institutional Design Principles represented by the papers in this special issue. We then turn our attention to detailing how the notion of CISs maps onto existing frameworks and provides additional analytical richness for the study of the commons. The commons research community has come a considerable distance in identifying and characterizing structure in the wide variety of institutional arrangements that have been observed in practice. With “institutional arrangements” we refer to clusters of rules, assembled from any number of individual rules based on building blocks from seven rule classes (Ostrom et al. 1994) that specify what actions are allowed or required, what information is accessible, and how costs and benefits are attached to actions and outcomes. A moment’s reflection will reveal the challenge in identifying structure in such clusters of rules: the diversity of possible viable institutional arrangements for any given CPR dilemma is enormous, a point to which we will return below. Nonetheless, commons scholars have made a huge effort through their systematic comparison of hundreds of case studies from irrigation, forestry, fisheries, and ground water systems to give some meaningful structure to the enormous variation in institutional arrangements possible in theory and observed in practice. Ostrom developed 8 Design Principles, familiar to readers of this journal, that describe broad features (i.e. structure) of rule clusters associated with successful CPR governance regimes and, thus, form a general basis for assembling rule clusters (i.e. designing institutions) capable of helping solve social dilemmas in CPR contexts. Ostrom later regretted using the term Design Principles (DPs) since they were more patterns or hypotheses emerging from case studies rather than blueprints for how to govern the commons (Ostrom et al. 2007). Nonetheless, the DPs do represent a generalizable structure of institutions. Ultimately, building a stronger empirical and theoretical basis for the Design Principles will be required to demonstrate their value. This requires the development and use of a systematic, robustly replicable methodology for case study analysis. It turns out that this is a difficult task for both practical and theoretical reasons. The foremost practical constraint is the magnitude of the task of systematically extracting data from many cases of social-ecological systems. Ideally, the same data would be collected with the same protocol in many study sites around the world for many years. Such an endeavor would be very costly and would be unlikely to attract long term funding (but see Wollenberg et al. 2007). Besides the International Forestry Resources and Institutions project, a major undertaking that focused on forests, there are few examples of large scale, long term primary data collection (see Poteete et al. 2010, for further discussion).1 In reality, most of the analysis of case studies depends on the extraction of data from secondary sources generated by scholars who collected data using different protocols to address different research questions. This makes it difficult to reconcile and compare data drawn from different secondary sources. Second is the challenge of developing a robustly replicable methodology to “code” the cases. As Ratajczyk et al. (2016, this issue) discuss, the coding of qualitative data requires multiple coders who systematically apply a coding protocol and discuss their results to resolve different interpretations of the qualitative information. Given these challenges, it is not surprising that beyond Ostrom’s large-N comparative analysis conducted to develop the Design Principles, there have been very few studies that systematically test the design principles ‘out of sample’. There are several interesting examples in which scholars search for the occurrence of particular instantiations of the Design Principles in particular contexts such as irrigation in Nepal (Ostrom and Benjamin 1993), agro-pastoralism in Tanzania (Quinn et al. 2007), and forestry cooperatives in Peru (Morrow and Hull 1996). The conclusions that can be drawn from such studies are typically limited to demonstrating that some subset of the design principles is present and that one or two of those present seemed to have contributed to better governance in a particular situation under investigation by the authors. Finally, supposing that the problems of reconciling data from different secondary sources and applying a coding protocol in a robustly replicable way were solved, we are left with the challenge of analyzing the data. Even if we limit the coding to presence or absence of the 8 design principles, this allows for 256 possible institutional configurations. Further, we must account for the fact that each of these 256 possible configurations may produce different outcomes depending on the context in which they operate. A useful analogy between how genes and gene regulatory networks guide organism development and how the DPs (a very simple “genetic” code for CISs) and networks of social and technological infrastructure impact social forms is informative. The analogy suggests that a systematic, long term research program is needed to fully explore the roles and impacts of the DPs on CISs. The work of Baggio et al. (2016) and Barnett et al. (2016) in this special issue is a first step in attempting to understand how institutional configurations may produce different outcomes depending on the context in which they operate. As we might expect, just as we now know with genes, the Design Principles do not operate individually. Rather, they co-occur in particular patterns, and those configurations depend on the social and biophysical context. It is important to note that Ostrom’s IAD framework defined the context as “external variables” that are held fixed for analysis. This is appropriate for analysis of short-term system performance. However, with the increasing focus on understanding the robustness and resilience of interactions between social and biophysical systems, contextual variables should be viewed as part of a complex adaptive system in which institutional arrangements, social, and biophysical components co-determine one another and coevolve over time. If our interest is in the design of systems that are robust and resilient, we need to take into account the structure and dynamics of all the attributes of the system in which institutional arrangements are endogenously determined. We can’t view institutional arrangements as causal factors in isolation. The collaborative project reported on in this special issue and our own work on irrigation systems (Anderies and Janssen 2013; Janssen and Anderies 2013) provides some insights for what an approach to study the structure and dynamics of systems involving shared resource governance might look like. Our basic premise is that the system of interest is best viewed as a set of dynamically interacting infrastructure classes in which institutions are viewed as one particular class. As a result, “governance” is seen not as something we do, but rather as an emergent feature of a coupled infrastructure system. This paper complements the other papers that have taken steps to grapple with the data and coding problems inherent to studying the commons (Ratajczyk et al. 2016) and uncover richer structure in institutional arrangements (Baggio et al. 2016) by extending existing frameworks to enable us to better understand the dynamic interplay between institutional structure and context. In the remainder of the paper, we flesh out both the rationale for and details of the proposed extensions. While the IAD framework has been in use for over 30 years [e.g. at least since Kiser and Ostrom (1982)] and is probably the most commonly-used framework for thinking about institutions in social-ecological systems, there remains significant variation in how it is applied in practice. The need for continued clarification and sharpening of the framework is evidenced in Ostrom’s own writing. As part of a special feature in the Policy Studies Journal on applications of the IAD framework, Ostrom clarified the intellectual basis of the IAD and “discuss[ed] how and why the framework itself has changed over time” (Ostrom 2011, 7). The papers presented in this special feature can be seen as clarifying the way different elements that constitute the action situation, a core component of the IAD, intermingle to produce outcomes in social-ecological systems. In the same way that the IAD framework has evolved over time based on feedback from its users, we suggest further extensions of the Robustness Framework, which is grounded in the IAD (Anderies et al. 2004; Ostrom 2009). We suggest these extensions based on our long-term collaboration with Ostrom on developing methods for studying the evolution of action situations over time which she saw as a key future challenge (Ostrom 2011). Collective action problems related to the creation and maintenance of infrastructure and the distributions of the outputs it generates are a central focus of analysis. In Anderies et al. (2004) we used shared infrastructure as a common feature of social ecological systems, building on Ostrom’s research on small-scale irrigation systems. The key elements of our extensions focus on thinking in terms of infrastructure and reemphasizing the importance of feedbacks in systems. 3.1. Why think in terms of infrastructure and systems? We are certainly not the first authors to advocate the importance of thinking in terms of infrastructure. In fact, there seems to be a recent movement in both academic (e.g. Frischmann 2005, 2012) and applied policy contexts (e.g. United Nations 2016) recognizing the importance of the concept of infrastructure. This movement reconceptualizes and applies notions of infrastructure beyond its traditional interpretations. Frischmann (2005), for example, refers to “nontraditional infrastructure”, e.g. environmental and intellectual infrastructure while the Habitat III Zero Draft Outcome Document for the Third United Nations Conference on Housing and Sustainable Urban Development refers to cultural and social infrastructures alongside more traditional transportation and sanitation infrastructures. infrastructure requires investment, i.e. entails an opportunity cost, to produce or maintain. That is, there is a fundamental trade-off between consuming valued flows in the present or directing them toward creating and maintaining infrastructure to produce future flows. While few would dispute these definitions, they are not sufficient to distinguish infrastructure from what economists have long referred to as capital. The difference between the terms is a matter of customary usage where the terms capital or infrastructure conjure notions of private or shared (partially non-rival) goods, or smaller or larger scales, respectively. Other factors that may distinguish infrastructure is that it is somehow foundational, valued mainly as an input contributing to multiple outputs [captured in (ii)]. Distinctions between these terms are difficult to maintain under careful scrutiny. Although we are deeply interested in public (or shared) infrastructure and the challenges of producing and maintaining it, the work presented here emphasizes the foundational aspect of infrastructure in our use of the term. Like Frischmann, our interest in infrastructure is motivated by how it functions in structuring social and economic processes in ways that can be very difficult to observe or quantify. While Frischmann focuses on how managing certain classes of partially non-rivalrous infrastructures as open access will generate positive spillovers that benefit society, our interest lies in how such inherent spillovers affect how different classes of infrastructure interact to produce dynamics at the system level. Specifically, our work on irrigation systems and other types of social-ecological systems (such as reported in this special issue) has led us to recognize that technology, environment, rules, norms, beliefs, and social bonds are intimately intertwined through “spill-overs” that are difficult to detect. Thus when we consider investments in particular classes of infrastructure (e.g. “environmental policy” is an investment in institutional infrastructure) we must be mindful of these hidden connections that are inherent to infrastructure. As a result, we suggest that the notion of “Coupled Infrastructure Systems” and the perspective it evokes is more appropriate than the term “Social-Ecological Systems”. The latter implies there are two distinct domains, the social and the ecological, that operate by their own logic. Each system logic can be understood in relative isolation and the interactions between the two domains can be identified, studied, and manipulated. The term coupled infrastructure system (CIS), on the other hand, suggests that the basic building blocks of all systems in which humans interact with one another and their environment (both built and natural) are classes of functional infrastructures and that distinctions between “social”, “ecological”, “natural” and “built” environments are artificial and can be misleading. The logic of these infrastructures cannot be understood in isolation and all relevant linkages between them cannot be identified. The 5 main types of infrastructure that constitute CISs are: (1) hard infrastructure which is human-made structures such as roads, irrigation systems, and nuclear power stations (cf. Frischmann 2005, “traditional infrastructure”); (2) soft infrastructure which are collections of human-made “instructions” for using other types of infrastructure such as institutional arrangements and decision making processes (cf. Frischmann 2005, “intellectual infrastructure”); (3) natural infrastructure which is hard infrastructure that is not human-made but is critical for society, such as wetlands for absorbing and filtering water (cf. Frischmann 2005, “environmental infrastructure”); (4) human infrastructure which refers to knowledge (often referred to as “knowledge capital” in economics, cf. Frischmann 2005, “intellectual infrastructure”); and (5) social infrastructure which refers to the relationships we have with others. In point (ii), our use of the term “affordance”, with which we refer to the possible outcomes that are accessible to individuals, independent of an individual’s ability to perceive this possibility, is a very deliberate reference to the “configural” nature of CISs and is consistent with Frischmann’s demand side theory of infrastructure: value is derived from downstream activities to which infrastructure is an input. We take this one step further by suggesting that generating value requires multiple infrastructures as inputs. For example, a tree does not produce wood for building materials. It does, however, provide an affordance for producing building material to a skilled person with an axe and a kiln to dry the wood. Computer hardware is useless without software. The hardware provides only an affordance for computational capacity. Likewise, the capacity of roads to provide transportation opportunities is limited without institutional arrangements for the use of the road. The work in this special issue focuses on how natural (ecosystems), hard human-made (technology), and soft human-made (institutions) infrastructures interact to produce outcomes in social dilemmas related to public good provision and resource governance. In the remainder of this paper, we argue that the notion CISs can be used to extend the IAD and Robustness Frameworks to (1) provide a systematic way of thinking that focuses on how these different infrastructures interact in terms of the functions they provide that avoids artificial and potentially misleading distinctions between various system elements, and (2) recognize and clarify the “configural” nature of systems, i.e. a minimal set of infrastructure classes is required before interesting higher-level organizational patterns emerge (i.e. well-being, communities, societies, etc.). When thinking in terms of CISs, the question is not “what is the right policy or set of institutions for a particular problem or context?” but, rather, “what infrastructures can we influence that might nudge a system to evolve toward a robust configuration that produces mass and information flows valued by society?”. Put simply, CISs, as technologies in the broadest sense, come in bundles and require holistic design that embraces both consciously-designed and self-organizing components. We are now in a position to apply the notions of infrastructure and CISs to existing frameworks. We emphasize that we are extending existing frameworks rather than introducing a new “CIS framework” out of the blue for two reasons: (1) we are hesitant to introduce yet another framework into an already crowded field, and, more importantly, (2) the elements of a CIS as we just described do not constitute a framework in the strict Ostrom sense of the word which “...identif[ies] the elements and general relationships among these elements that one needs to consider for institutional analysis and........provide[s] a general set of variables that can be used to analyze all types of institutional arrangements.” (Ostrom 2011, 8). Rather, the notion of a CIS redefines the basic unit of analysis to which institutional analysis is applied and emphasizes the importance of the special characteristics of infrastructure to understanding most problems of interest to scholars of governance of shared assets in multi-agent systems. By way of comparison, the “SES” which is the unit of analysis in what has come to be known as the “SES Framework” is not the same as the framework itself.2 SESs are special cases of CIS in which the importance of some classes of infrastructure (e.g. natural infrastructure) are assumed to be more important (or of interest) than others (e.g. built infrastructure). Our emphasis on the special features of infrastructure begins to flow into the realm of theory as relations among subsets of concepts and variables are explored and explained. We can easily apply any of the existing, intimately related, IAD (Kiser and Ostrom 1982), Robustness (Anderies et al. 2004), “Multitier” (Ostrom 2007), and “General Sustainability” (Ostrom 2009) frameworks using the CIS unit of analysis to enrich their capacity to “..organize diagnostic and prescriptive inquiry.” (Ostrom 2011). We will illustrate this point using the IAD and Robustness Frameworks as examples. Because the IAD Framework grew out of the political science and policy analysis scholarly traditions its development and use has generally focused on the social and institutional domain. For example, the core conceptual unit of the IAD is the action situation (Figure 1) “....that can be utilized to describe, analyze, predict, and explain behavior within institutional arrangements.” (Ostrom 2011, 11). Likewise, while reflecting on the background of the IAD, Ostrom makes the intended application of the IAD explicit in her remark that the “framework can be applied to a variety of important policy questions.” (Ostrom 2011, 7). Ostrom notes that because of its social science origins, scholars have “...frequently focused on the working parts of the situation itself rather than on the factors underlying any particular action situation.” (Ostrom 2011, 21) and goes on to suggest the need for a better understanding of the factors that structure action situations and how action situations evolve over time through changing perceptions induced by recursive interactions. These issues motivated the development of the more general SES and Robustness frameworks and, in turn, the extensions we present here. (A) The IAD framework from a CIS perspective. Biophysical Conditions, Attributes of the community and Rules-in-use are conceived of as infrastructures. (B) The “Robustness of CIS Framework” (or “CIS Framework” for short). The italicized text and white ovals and boxes show the original Anderies et al. (2004) Framework. The dashed shapes illustrate how the external variables Biophysical Conditions, Attributes of the community and Rules-in-use of Ostrom’s IAD are parsed in the Robustness Framework. 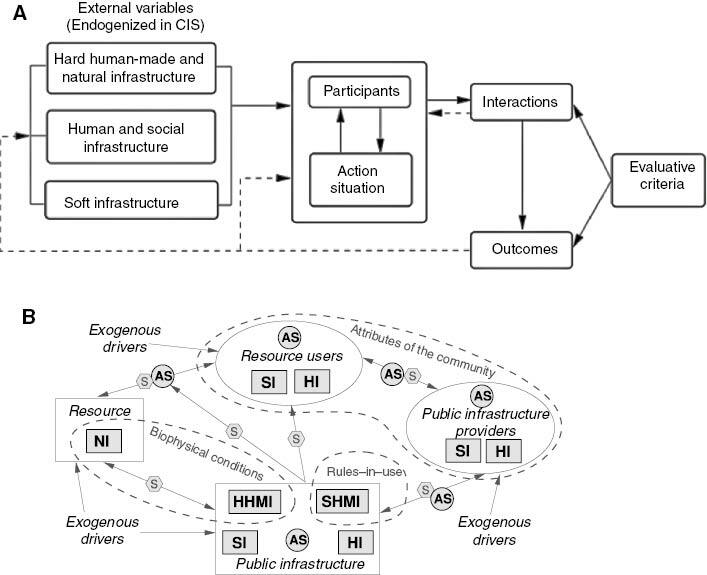 The grey boxes labelled with NI, SI, HI, SHMI, HHMI represent how natural, social, human, soft human-made, and hard human-man infrastructures are distributed across the system. The grey circles labelled with AS represent the potential numerous linked action situations. Finally, the grey hexagons labelled with S represent spillovers. See text for further explanation. The CIS perspective contributes to institutional analysis on two levels. First, at the level of the action situation, the CIS perspective responds to Ostrom’s call to better understand factors that structure action situations by re-framing “external variables” as functional infrastructures (Figure 1A) while emphasizing dynamic feedback processes that produce recursive interactions. Second, the CIS perspective can help advance understanding at the system level, zooming out from the action situation by envisioning it as an information processing infrastructure that interacts with other infrastructures to affect system level features such as resilience and robustness [Figure 1B as adapted from Anderies et al. (2004)]. Ostrom’s Design Principles that are the focus of this special issue are, as we discuss in more detail below, concise descriptions of information processing infrastructure. More recent instantiations of the IAD framework (e.g. Ostrom 2005, and later) include dynamics and feedbacks when evaluative criteria are applied to outcomes, generating signals that feed back to the action situation itself and to the “external variables” (dashed lines, Figure 1A). Further, the IAD implicitly recognizes two timescales, one fast in which signals feed back to the action situation itself, and one slow in which signals feed back to the key structuring external variables. Ostrom’s call to advance institutional analysis generally focuses on understanding the faster (inner) loop – i.e. how do the dynamics of recursive action situations play out in terms of the capacity for groups to engage in collective action. The CIS perspective focuses more on the slower (outer) loop. At that scale, multiple operational-level action situations related to daily management of natural and hard human made infrastructures (the faster inner loop) interact with collective-choice-level action situations related to public good provision. Together, these linked action situations structure dynamic change in the CIS. At this level of analysis, we are interested in what constellations of infrastructures support robust networks of linked action situations and institutional structures and, in turn, robust and resilient CISs capable of delivering wellbeing in the face of change. We will now illustrate how adopting the CIS unit of analysis and thinking in terms of infrastructure extends the IAD and Robustness Frameworks by way of some concrete examples. First, we reframe the “external variables” in the IAD as shown in Figure 1A. The biophysical conditions are constituted by both human-made hard and natural hard infrastructure. Attributes of the community include human and social infrastructure (knowledge and social capital) within the community. Finally, rules-in-use are soft human-made infrastructure. Figure 1B shows the extension of the Robustness of SES Framework to the Robustness of CIS Framework. The key additions emphasize networks of action situations that influence the interactions between different infrastructures and the importance of positive and negative spillovers that are important in structuring CISs but can be difficult to observe or predict. It is important to point out that Figure 1A and B are intimately related and capture the same phenomenon on different time scales and levels of analysis. On short time scales during which the characteristics of infrastructure remain approximately constant (i.e. can be treated as “external variables”), we can zoom in on any of the action situations in Figure 1B and effectively represent it with the IAD shown in Figure 1A. The examples in the next section will help illustrate how this reframing in terms of infrastructure can be used to generate new insights. We begin with some examples using Ostrom’s notion of the internal structure of an action situation that emphasizes ‘institutions as rules’ shown in Figure 2 (in black). Here, elements from the seven classes of rules mentioned above determine what positions can be assumed by actors in the action situation such as chair or director (through position rules), which actors may assume those postions, e.g. must be a member of the village, (through boundary rules), and what actions actors in positions can take (through choice rules). Choices are linked to outcomes via how much information actors have (through information rules), and how much control individual actors have (through aggregation rules). Potential outcomes are limited by scope rules. Finally, actors make decisions in action situations by assigning costs and benefits to outcomes which are conditioned by payoff rules. Thus, by restricting some actions and enabling others, institutions structure the action situation and move the system of recurring action situations toward desirable outcomes. In this view, institutions are protocols that help animate CISs given biophysical constraints. Ostrom’s schematic for the internal structure of the action situation emphasizing the role of rule clusters in structuring action situations. Adapted from Ostrom (2011, figure 3). The notion of governance should more strongly emphasize the importance of features other than rule-structured social interactions in producing outcomes. In some cases, outcomes may depend less on social interactions than on other processes and, as a result, the details of social interactions in a particular case may not help us understand “successful governance”. Thinking of governance as an infrastructure system highlights the practical aspects of effective conflict resolution, monitoring, and sanctioning processes that typically receive less attention in the literature than institutional arrangements (understood as rules and norms), trust, and communication. In some irrigation systems, the natural and hard human-made infrastructure generate positive spillovers that substitute for institutional functions. Specifically, monitoring functions can be a by-product of the operation of the water distribution systems in irrigation systems in steep terrain. In this way, there is a postive spillover from collective-choice level institutional arrangements for provisioning hard infrastructure that relieve pressure on collective-choice level institutional arrangements for monitoring that acts through operational-level arrangements about water distribution that depend intimately on the functioning of the canal infrastructure and land form (natural infrastructure). This example illustrates the complex interplay and spillover effects among multiple infrastructures as depicted in Figure 1B. It is likely that the dynamic evolution of action situations involves interactions at several time scales that are difficult to identify, giving rise to subtle interactions that are difficult to disentangle. Such a view acknowledges the difficulty, for example, of understanding how formal and informal institutions interact, how institutions interact with perceptions, and how all these interact with technology. These two points suggest that in some situations we may think of actions as bi-directional and add “emerge from” (shown in red) to “assigned to.” within the action situation. In this case, actors are constantly generating new self-images and mental models as they occupy positions in networks of social relations in essence defining new actors and new possible actions. This process occurs on relatively fast timescales on the “inner” loop in Figure 1A. 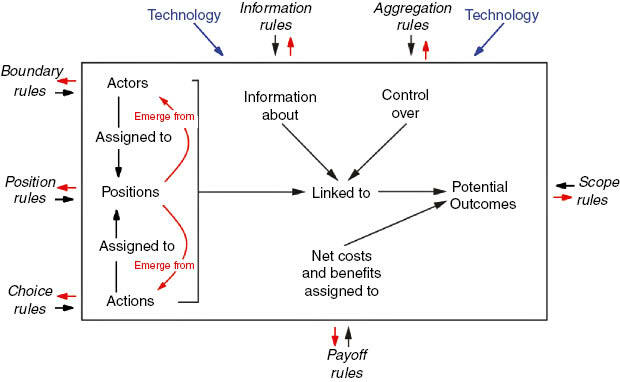 Likewise, arrows between the action situation and rules regarding information, control, outcomes, and costs and benefits are in the opposite direction (again shown in red) are added. In the traditional view of institutions, these red arrows may represent collective choice and constitutional choice arrangements operating on a slower timescale (“outer” loop in Figure 1) whereby rules are changed in a highly rule-structured way. The CIS alternative view suggests that in some situations institutions are not rules that guide action and animate social interactions but, rather, are simply reflections of common knowledge regarding self-sustaining features of social interactions (Aoki 2001, 2007), i.e. a by-product of interactions between human and social infrastructures. Rules are then codified public representations of this common knowledge. Aoki (2007) suggests that we might label the black arrow and text version of Figure 2 as the “exogenous” and the red version the “endogenous” view of institutions. In the endogenous view, institutions are emergent features of the dynamic interaction between the various classes of infrastructure that constitute the action situation generated by a large number of microsituational variables. This view has implications for how we might think of institutional design and policy analysis. Another example from lobster fisheries illustrates the importance of point (1). Lobster traps have buoys that convey information about who is fishing where and the way lobster traps are set and recovered strongly conditions catch. Lobstering technology considerably reduces the costs of monitoring (painted buoys are easy to see) and sanctioning (traps are easy to cut/destroy). The spillovers from lobster fishing technology (hard infrastructure) combined with norms related the use of painted buoys (social/human infrastructure) that allows the fishers to avoid investment in more expensive monitoring and sanctioning arrangements may thus be a more important determinant of effective governance than formal institutional arrangements. A CIS may thus be an accidental beneficiary of the configuration of its infrastructure by which it was able to “solve” a perceived (by an outside observer) social dilemma that actually doesn’t exist. These examples illustrate how the difficult-to-quantify spillover aspect of infrastructure helps clarify subtleties of the functioning of monitoring and sanctioning at the level of the action situation. Our next example of the Prisoner’s dilemma as a metaphor for the tragedy of open-access is an illustration of the importance of the configural nature of CISs. Readers of this journal will know the story of the prisoners dilemma in which two prisoners are isolated, not allowed to communicate, and are offered a rather nasty choice to provide certain information. This situation generates payoffs in an abstract game to illustrate one type of social dilemma. This is a perfectly reasonable story. The problem arises when this abstract game is applied to other situations such as overuse of some shared stock such as a pasture, fishery, forest, or atmosphere. The problem is that the infrastructure configuration of the prisoner’s dilemma simply does not apply to these other situations. In a very insightful paper, Cole and Grossman (2010) explain why the “[h]erder problem is not a prisoner’s dilemma” in terms of the fact that the institutional infrastructures in the two situations are very different. In the Prisoners’ dilemma story, the relevant institutions stem from criminal law focused on establishing guilt and imposing sanctions. Thus, the payoff rules are designed to promote defection. The CIS perspective suggests that we consider the role of other infrastructures as well. In fact, some combination of hard human-made (the prison cell) and human infrastructure (skilled, uncorrupted guards) is required to prevent communication. Since there are typically no such payoff rules to promote defection or infrastructures to prevent communication between herders in herder systems, it makes little sense to apply the prisoners’ dilemma logic to such cases. So while the prisoners’ dilemma provides some insight into social dilemmas, it arguably provides very little in the way of general principles for designing effective governance for CISs. In this example, the CISs perspective highlights what we might refer to as the “overlooked configuration constraints” problem. More simply put, we must be careful not to ascribe too much importance to the intrinsic decision-making behavior of agents in explaining outcomes that are strongly constrained by context. We close with an example that zooms out from the action situation to the system level (as in Figure 1B). Payment for ecosystem services (PES) has become a popular approach to manage ecosystems or, in the language of CISs, to invest in natural infrastructure. Issues related to the challenges and opportunities for implementation of PES have received considerable attention in the literature. Specifically, PES is an appeal to develop and implement market-like mechanisms to generate investment in natural infrastructure where no markets exist. However, because ecosystems are infrastructure, and infrastructure is foundational, contributing value primarily as an input to many downstream activities that are difficult to characterize and quantify, markets are not appropriate. Research in this area reflects this fact, calling for the need for science to characterize and measure the bundles of services ecosystems provide and link them to value streams (Farley and Costanza 2010; Wong et al. 2015). This is exactly the supply side focus that Frischmann (2005) suggests will ultimately fail to fully account for how natural infrastructure may be used to generate social benefits. Science is not up to the task to discover and assign value to all the potential value steams natural infrastructure may generate. We conclude our set of examples with another important issue made salient by the CIS perspective that we refer to as the “missing infrastructure” problem. Commodification is a basic and natural precursor to the operation of market-based logic. The market-based logic of PES thus requires the quantification and commodification of affordances from natural infrastructure. For most products exchanged in markets, commodification infrastructure is relatively simple, e.g. products can be enumerated using a counting system (soft human-made infrastructure). Where counting is impractical or costly as with grains or liquids, scales and standard volume vessels can be used to enumerate them. In the absence of simple commodification infrastructure for affordances from natural infrastructure, highly specialized additional knowledge and scientific capacity (human and human-made infrastructure) are required. Attempting to implement PES in a system without considering this required commodification infrastructure can generate unintended consequences. Typically, one of two things happens: affordances from natural infrastructure are reduced in number and simplified, or experts from governments and NGO’s fill the void (assume the role of public infrastructure providers to provide public infrastructure as in Figure 1B.) These gatekeepers of the value (and, thus, supply) of infrastructure may not serve the best interests of all potential stakeholders (Scales 2015) with the result that costs and benefits of PES will be unevenly distributed. The CIS perspective, with its systems view and emphasis on the configural nature of infrastructure immediately leads to the key question regarding PES: how does the cost of providing the necessary commodification infrastructure for PES schemes compare to the investments they generate? This is a quite different question than those being addressed in the PES literature. We conclude this section with one final general feature of CISs: inertia. The fundamental properties (i–iii) of infrastructure impact collective action problems in important ways. The creation of shared infrastructure typically requires investment from a large number of people. Infrastructure requires investment to maintain it’s performance at the levels for which it was initially designed. We have to invest resources in the form of time and energy to maintain roads, enforce rules, sustain wetlands, keep up our knowledge and maintain relationships. Finally, the outcomes generated from the interactions of infrastructures often have distributional effects. How are the benefits allocated and access arranged? Inequality and power differences are important characteristics of coupled infrastructure systems that can impact their performance. Another important feature of infrastructure is the importance of path dependency. Investments made to create new infrastructure can have lasting effects, both directly and through multiple spill-over effects. Transitioning from a fossil fuel based energy system to one based on distributed renewable resources is hindered by the sunk costs associated with the infrastructure and the values, beliefs, and perceptions that support the existing energy system. Changing human behavior can be hindered by existing habits, entrenched social norms, and social commitments. A common saying is that science progresses with every funeral, referring to the reluctance of the existing scientific establishment to adopt new scientific paradigms. Looking at systems on a longer time scale enables us to look at the interactions of different types of infrastructure and generate understanding about which configurations of infrastructure enhance resilience or enable transformations. If we look at the rapid change in communication technology since the 1990s, we see that the combination of hard infrastructure (devices, internet, etc), soft infrastructure (world wide web, software applications), and social infrastructure (social networks in person and online) have led to a rapid co-evolution of the information transmission and exchange infrastructure that defines our age. The analysis of these examples illustrates how the CIS perspective, by heightening our awareness of the configural nature of infrastructure systems, of the many spill-overs inherent to infrastructure, and of the value of conceptualizing institutions as emergent features of interacting infrastructures, causes us to ask a broader set of questions regarding institutional design: What is the missing infrastructure? What are the unobserved spill-overs that may make or break the system? In what ways can inertia impact the performance of institutional design? We argue that careful consideration of these questions will lead to better institutional analysis and design. With that in mind, we conclude with a view of Ostrom’s Institutional Design Principles as infrastructure. Clearly defined boundaries are essential for any form of public infrastructure to monitor the state of natural infrastructure (biophysical boundaries) and transmit it to the relevant decision-makers (social boundaries). Congruence between local conditions and institutional arrangements amplifies positive spillovers and attenuates negative spillovers between different infrastructures that reduce the costs of providing shared infrastructure, coordinating activities, and monitoring system behavior. Collective choice arrangements provide a mechanism by which information about system outputs (outcomes), processed by multiple agents in a decentralized fashion is translated into coordinated actions that feed back into the system as inputs. Monitoring of individual behavior is essential to ensure that appropriate feedback actions are actually being implemented. Graduated sanctions provide a means by which deviations in the behavior of feedback processes can be corrected. Rapid corrections lead to instabilities in feedback systems, thus the importance of graduated sanctions. Conflict resolution mechanisms provide a mechanism for reconciling (1) “measurement error” that takes the form of conflicting interpretations of information, and (2) the consequences of undesired outcomes for (some of) the participants. Recognition of rights to organize increases the fidelity of information processing and strengthens the linkage between information processing and appropriate feedback actions through empowerment of local appropriators to devise their own rules. Nested enterprises provide capacity for information processing (decision-making) and action at multiple temporal and spatial scales. It is well known that regulatory feedbacks operating at multiple scales are essential for mainting complex structures over time (Csete and Doyle 2002). Viewed as a component of CISs, Ostrom’s DPs are guidelines for the design of regulatory feedback network structures capable of maintaining complex social structures involving shared infrastructure. In this light, the results of the empirical work in this special feature suggesting that infrastructure components reflecting almost all the DPs are required for success in many cases is not surprising. The analogy is an electrical circuit with hundreds of components that may not function if just one is removed. A glance through the list of DPs above should convince the reader that most are required for the fully functioning regulatory feedbacks that are essential for “good governance”. In this paper, we have developed an infrastructure lens through which to view the problem of governance of shared resources. This lens enabled us to extend the original Robustness Framework and link it more directly with the IAD Framework. Through several examples, we have attempted to demonstrate that the resulting “CIS Framework” can be used to examine and explain problems associated with governing shared infrastructure that may have previously been overlooked. There is a growing body of work on the importance of infrastructure in the context of governance of SESs that has stimulated articles, special features in journals, conference panels, and, given our collaboration with Ostrom over the years on this topic, numerous direct inquiries to us about how Ostrom’s SES framework can be operationalized for the management of infrastructure systems. Our answer is to employ the CIS Framework. We will close by introducing some research opportunities that emerge from potential applications of the CIS Framework. As discussed in Ratajczyk et al. (2016) a critical challenge in coding case studies is a consistent mutual understanding of the qualitative information available. Although we discuss the results in this special issue from the perspective of CPR systems, we began using the CIS view during the project which provided a helpful consistent terminology for our team. Future versions of the coding protocols will be more in line with the perspective provided by the CIS Framework. Secondly, a challenge that the CIS Framework helps address is the dynamic, multi-scale characteristics of many resource systems which are difficult to code. An infrastructure perspective may help by providing consistent terminology that can be easily understood and used across multiple disciplines such as economics, engineering, and political science. An example might be to code the rate of decline of the performance of particular classes of infrastructure in a given system; a critical feature of many systems that a focus on rules and social interactions might overlook. Thirdly, the CIS Framework enables researchers to broaden the scope of case studies to include, for example, challenges in urban systems for which the SES Framework, with its emphasis on ecological systems, is not well suited. In fact, one of the main challenges in the coming years will be to maintain the performance of hard infrastructure such as energy and freshwater production and distribution systems as well as road and rail systems. Hurricanes Katrina and Sandy had major impacts in New Orleans and New York and demonstrated the vulnerability of hard infrastructure to natural shocks. However, this is not just an engineering problem (LePatner 2010; Karvonen 2011). We argue that a broader perspective is needed to study these types of problems, and that looking at the interactions among different types of infrastructure, including difficult-to-measure spillovers, is a step in the right direction. For example, Mexico City is built on a dry lake bed, has flooding problems, but at the same time lacks the capacity for reliable distribution of clean freshwater to most neighborhoods. Many problems associated with different infrastructure systems converge in this case including those affecting an under provision of maintenance of infrastructure, others that result in a low level of waste water treatment capacity within Mexico City, and still others related to collection of garbage which, when not done properly, leaves garbage in the street which can end up clogging the water flow systems. We hope that our reflection on some of the lessons learned from the research reported in this special issue and the introduction of the notion of CISs will stimulate a discussion in the commons research community about how we can work together to improve the comparative analysis of case studies of shared resources beyond the scope Ostrom originally addressed. We hope this fosters the development of new theory and new communities of practice. 1For details on the International Forestry Resources and Institutions project see http://www.ifriresearch.net/. 2The actual name of the “SES Framework” is the “Framework for Analyzing Sustainability” (cf. title of Ostrom 2009). Ostrom has previously referred to the same framework as a “multitier framework to analyze SESs” (Ostrom 2007). Contraction of such names, as a by product of scientific communities of practice, to “SES Framework” is problematic as terms have specific connotations within those communities that do not translate will into other communities. We would like to thank an anonymous reviewer for very insightful remarks that significantly contributed to refining the direction of the paper and improving the presentation. Anderies and Janssen greatfully acknowledge financial support from the U.S. National Science Foundation grant GEO-1115054. Acheson, J. M (2006). Institutional Failure in Resource Management. Annual Review of Anthropology 35: 117–134. http://dx.doi.org/10.1146/annurev.anthro.35.081705.123238. Anderies, J. M and Janssen, M. A (2013). Robustness of Social-Ecological Systems: Implications for Public Policy. Policy Studies Journal 41(3): 513–536. http://dx.doi.org/10.1111/psj.12027. Aoki, M (2001). Toward a Comparative Institutional Analysis. Cambridge, MA, USA: MIT press. Aoki, M (2007). Endogenizing Institutions and Institutional Changes. Journal of Institutional Economics 3(01): 1–31. http://dx.doi.org/10.1017/S1744137406000531. Berkes, F and Folke, C (1998). Linking Social and Ecological Systems for Resilience and Sustainability In: Linking Social and Ecological Systems: Management Practices and Social Mechanisms for Building Resilience. Berkes, F and Folke, C eds. : 1–25. Cambridge, UK: Cambridge Univerisity Press. Clark, C. W (2006). The Worldwide Crisis in Fisheries: Economic Models and Human Behavior. Cambridge, UK: Cambridge University Press. Cole, D. H and Grossman, P. Z (2010). Institutions Matter! Why the Herder Problem is not a Prisoner’s Dilemma. Theory and Decision 69(2): 219–231. http://dx.doi.org/10.2139/ssrn.1114541. Csete, M. E and Doyle, J. C (2002). Reverse Engineering of Biological Complexity. Science 295: 1664–1669. http://dx.doi.org/10.1126/science.1069981. Farley, J and Costanza, R (2010). Payments for Ecosystem Services: From Local to Global. Ecological Economics 69(11): 2060–2068. http://dx.doi.org/10.1016/j.ecolecon.2010.06.010. Frischmann, B. M (2005). An Economic Theory of Infrastructure and Commons Management. Minnesota Law Review 89: 917–1030. Frischmann, B. M (2012). Infrastructure. Oxford, UK: Oxford University Press. http://dx.doi.org/10.1093/acprof:oso/9780199895656.001.0001. Hardin, G (1968). The Tragedy of the Commons. Science 162(3859): 1243–1248. Janssen, M. A and Anderies, J. M (2013). A Multi-Method Approach to Study Robustness of Social–Ecological Systems: The Case of Small-Scale Irrigation Systems. Journal of Institutional Economics 9(4): 427–447. http://dx.doi.org/10.1017/S1744137413000180. Karvonen, A (2011). Politics of Urban Runoff: Nature, Technology, and the Sustainable City. Cambridge, MA, USA: MIT Press. Kiser, L. L and Ostrom, E (1982). The Three Worlds of Action: A Metatheoretical Synthesis of Institutional Approaches In: Strategies of Political Inquiry. Ostrom, E ed. : 179–222. Beverly Hills, CA: Sage. LePatner, B. B (2010). Too Big to Fall: America’s Failing Infrastructure and the Way Forward. Lebanon, NH, USA: University Press of New England. Morrow, C. E and Hull, R. W (1996). Donor-Initiated Common Pool Resource Institutions: The Case of the Yanesha Forestry Cooperative. World Development 24(10): 1641–1657. http://dx.doi.org/10.1016/0305-750X(96)00064-2. Ostrom, E (2005). Understanding Institutional Diversity. Princeton, NJ: Princeton University Press. Ostrom, E (2007). A Diagnostic Approach for Going Beyond Panaceas. Proceedings of the National Academy of Sciences 104(39): 15181–15187. http://dx.doi.org/10.1073/pnas.0702288104. Ostrom, E (2009). A General Framework for Analyzing Sustainability of Social-Ecological Systems. Science 325(5939): 419–422. http://dx.doi.org/10.1126/science.1172133. Ostrom, E (2010). Beyond Markets and States: Polycentric Governance of Complex Economic Systems. The American Economic Review 100(3): 641–672. http://dx.doi.org/10.1257/aer.100.3.641. Ostrom, E (2011). Background on the Institutional Analysis and Development Framework. The Policy Studies Journal 39(1): 7–27. http://dx.doi.org/10.1111/j.1541-0072.2010.00394.x. Ostrom, E and Benjamin, P (1993). Design Principles and the Performance of Farmer Managed Irrigation Systems in Nepal In: Performance Management in Famer-Managed Irrigation Systems: Proceedings of an International Workshop of the Farmer-Managed Irrigation Systems Network, held at Mendoza, Argentina, from 12–15 November, 1991. Manor, S and Chambouleyron, J eds. : 53–62. Columbo, Sri Lanka: International Irrigation Managment Institute. Ostrom, E, Gardner, R and Walker, J (1994). Rules, Games, and Common-Pool Resources. Ann Arbor, MI, USA: University of Michigan Press. Ostrom, E, Janssen, M. A and Anderies, J. M (2007). Going Beyond Panaceas. Proceedings of the National Academy of Sciences 104(39): 15176–15178. http://dx.doi.org/10.1073/pnas.0701886104. Poteete, A. R, Janssen, M. A and Ostrom, E (2010). Working Together: Collective Action, the Commons, and Multiple Methods in Practice. Princeton, NJ, USA: Princeton University Press. http://dx.doi.org/10.1515/9781400835157. Quinn, C. H, Huby, M, Kiwasila, H and Lovett, J. C (2007). Design Principles and Common Pool Resource Management: An Institutional Approach to Evaluating Community Management in Semi-Arid Tanzania. Journal of Environmental Management 84(1): 100–113. http://dx.doi.org/10.1016/j.jenvman.2006.05.008. Rose, C (1986). The Comedy of the Commons: Custom, Commerce, and Inherently Public Property. The University of Chicago Law Review 53(3): 711–781. http://dx.doi.org/10.2307/1599583. Scales, I (2015). Paying for Nature: What Every Conservationist Should Know About Political Economy. Oryx 49(2): 226–231. http://dx.doi.org/10.1017/S0030605314000015. United Nations. Habitat III zero draft outcome document. Technical report, The Third United Nations Conference on Housing and Sustainable Urban Development, https://www.habitat3.org/bitcache/b581c7d6129c25b03b0102e2a7e5e175e9019535?vid=586129&disposition=inline&op=view. Von Weizsaecker, E, Young, O and Finger, M (2005). Limits to Privatisation. London: Earthscan. Wong, C. P, Jiang, B, Kinzig, A. P, Lee, K. N and Ouyang, Z (2015). Linking Ecosystem Characteristics to Final Ecosystem Services for Public Policy. Ecology Letters 18(1): 108–118. http://dx.doi.org/10.1111/ele.12389.